Chemotherapy. 2012;58(1):70-7. doi: 10.1159/000335590. Epub 2012 Feb 23. 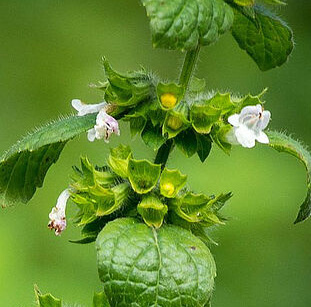 Melissa officinalis extract inhibits attachment of herpes simplex virus in vitro. Astani A, Reichling J, Schnitzler P.
Department of Infectious Diseases, Virology, University of Heidelberg, Heidelberg, Germany. Extracts and essential oils of medicinal plants are increasingly of interest as novel drugs for antiherpetic agents, since the herpes simplex virus (HSV) might develop resistance to commonly used antiviral drugs. An aqueous extract of Melissa officinalis as well as phenolic extract compounds, i.e. caffeic acid, p-coumaric acid and rosmarinic acid were examined for their antiviral activity against herpes simplex virus type 1 (HSV-1) in vitro. When drugs were added to HSV-1-infected cells, no antiviral effect was observed as determined by plaque reduction assay and analysis of expression of viral protein ICP0. However, the Melissa extract demonstrated a high virucidal activity against HSV-1, even at very low concentrations of 1.5 μg/ml, whereas similar results for phenolic compounds were only achieved at 100 times higher concentrations. Besides the virucidal activity, the Melissa extract and rosmarinic acid inhibited HSV-1 attachment to host cells in a dose-dependent manner. These results indicate that rosmarinic acid was the main contributor to the antiviral activity of Melissa extract. However, the selectivity index of Melissa extract of 875 against HSV is superior to the selectivity indices of single constituents. Melissa extract exhibits low toxicity, is virucidal and affects HSV-1 attachment to host cells in vitro. HNO. 2011 Dec;59(12):1176-84. doi: 10.1007/s00106-010-2253-0. [Efficacy of plant products against herpetic infections]. Essential oils from various aromatic medicinal plants are highly active against some viral infections, e.g. labial herpes caused by herpes simplex virus type 1. Balm oil, tea tree oil and peppermint oil demonstrate in vitro a significant antiherpetic activity, mainly related to a direct drug-virus particle interaction, some essential oils also act directly virucidal. Interestingly, these essential oils are also highly active against acyclovir-resistant herpes simplex virus strains. In clinical studies, tea tree oil has been shown to possess antiherpetic, anti-inflammatory and pain-relieving properties, as well as to accelerate the healing process of herpes labialis. Applying diluted essential oils three to four times daily for the antiherpetic treatment of affected areas is recommended. ^ Kucera, Louis S.; Cohen, Ronald A.; Herrmann, Ernest C. (2006). "Antiviral Activities of Extracts of the Lemon Balm Plant". Annals of the New York Academy of Sciences 130 (1): 474–82. doi:10.1111/j.1749-6632.1965.tb12584.x. PMID 4285591. ^ Allahverdiyev, A; Duran, N; Ozguven, M; Koltas, S (2004). "Antiviral activity of the volatile oils of L. Against virus type-2". Phytomedicine 11 (7-8): 657–61. doi:10.1016/j.phymed.2003.07.014. PMID 15636181. ^ Schnitzler, P; Schuhmacher, A; Astani, A; Reichling, J (2008). "Melissa officinalis oil affects infectivity of enveloped herpesviruses". Phytomedicine 15 (9): 734–40. doi:10.1016/j.phymed.2008.04.018. PMID 18693101.